14 x 6 Plastic Decorative Baseboard Cover Discounts Apply ! Finally! A decorative baseboard return option that is also rust proof! 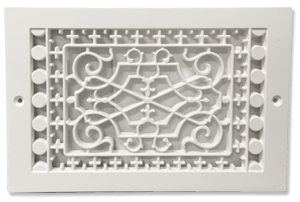 This plastic decorative baseboard cover is sold in a white color, but it can be painted to match your decor. SMI Ventilation Products plastic baseboard return grilles are made of a high-impact polystyrene polymer resin that makes them durable and rust proof. The depth (from the wall) of this baseboard return air grill measures 3/4 inch. Example: This 14x6 decorative baseboard cover fits a 14 inch wide x 6 inch height opening in the wall. The overall faceplate dimensions of the baseboard return grill measure 16 inches x 8 inches. This plastic decorative baseboard cover is available in other standard sizes. Don't hide your baseboard returns! Purchase theses decorative baseboard covers to complete the look of your home.